Sure a barbecue on Australia Day is all very well but you'll also be needing something fresh and healthy to balance out all those chops and snags. These crisp green-and-gold lettuce wraps of mango, cucumber, avocado and mint in a sesame and sweet chilli vinaigrette celebrate everything we love about Australia in summer. 1. Separate the lettuce leaves, wash, spin-dry and chill until needed. 2. For the dressing, whisk the ingredients in a large bowl. 3. 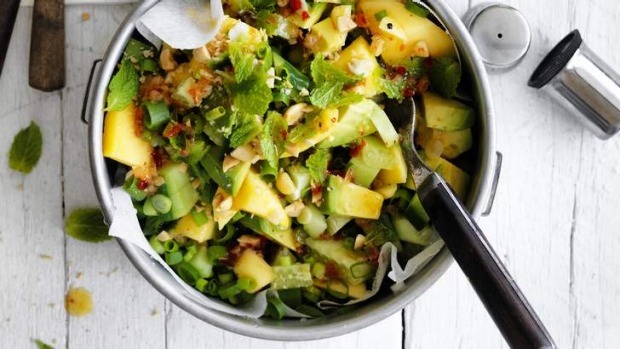 Finely dice the mango, avocado and cucumber, and lightly toss in the dressing with the spring onions, mint leaves, sea salt and pepper. Transfer to a serving bowl and scatter with sesame seeds or crushed peanuts (or both). Serve with a spoon and a pile of chilled cos leaves so that people help themselves.